Available May 16. Pre-order now! Most St. Louis Cardinals fans have taken in a game or two at Busch Stadium, have seen highlights of a young Ozzie Smith, and enjoyed Matt Carpenter’s salsa-induced hot streak in 2018. But only real fans have visited “Trinket City,” know the origin of the Redbird logo, or understand the significance of the number 1.12. 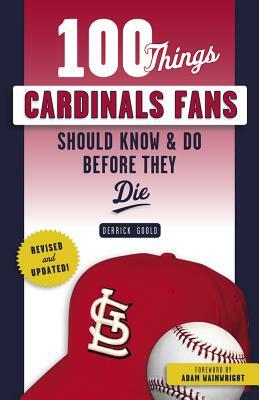 In this revised and updated edition of 100 Things Cardinals Fans Should Know & Do Before They Die, author Derrick Goold collects every essential piece of Cardinals knowledge and trivia, as well as must-do activities, and ranks them all from 1 to 100, providing an entertaining, enlightening, and easy-to-follow checklist as you progress on your way to fan superstardom.